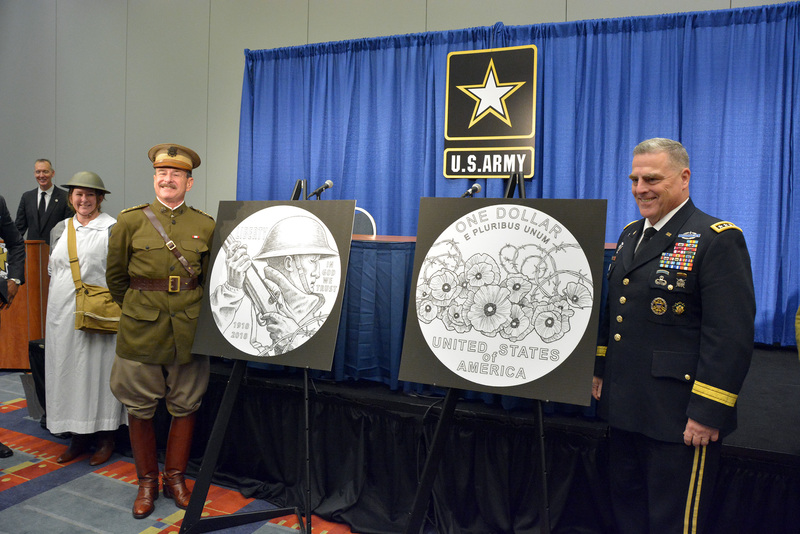 Acommemorative coin marking the 100th anniversary of U.S. participation in World War I was unveiled by Acting Army Secretary Ryan McCarthy and Army Chief of Staff Gen. Mark A. Milley at the Association of the U.S. Army’s Annual Meeting and Exposition. In a small ceremony following the meeting’s opening ceremony, re-enactors dressed as American soldiers, NCOs and officers joined McCarthy, Milley, World War I Centennial Commission Chair Terry Hamby and T.V. Johnson, director of the U.S. Mint’s corporate communications, for the unveiling. In his remarks, McCarthy noted that 100 years ago, the modern Army we know today began and its storied divisions came to be in response to worldwide threats that sparked World War I. He thanked Congress for authorizing the $1 collectible coin, and put forth the importance of honoring and learning from the lessons of yesterday’s troops. “Our soldiers performed a difficult mission and left a legacy that touches us all every day. No war should be forgotten, no military member’s service should be forgotten,” McCarthy said. Developed and produced by the U.S. Mint, the coin was authorized by statute in 2014 through bipartisan legislation. The Secretary of the Treasury selected the winning coin design after the Mint held an open design competition in 2016 judged by a six-member panel with three members each from the U.S. Commission of Fine Arts, Citizens Coinage Advisory Committee, and chaired by the Secretary of the Treasury’s designee. One side of the coin is titled “Soldier’s Charge,” and shows a stone-like soldier gripping a rifle. Barbed wire twines are featured in the lower right-hand side of the design. On the other side, the wire design continues in a design titled “Poppies in the Wire,” which features abstract poppies mixed with barbed wire.